Many coastal states have an insufficient number of public beach access points, with some states averaging less than one access point for every ten miles of shoreline. Access to the beach is threatened every day. From locked gates to restricted hours, from exclusive developments to economic barriers, these threats all limit access to our public beaches. We believe that beaches should be accessible to everyone. Our network of chapters, clubs and volunteers are determined to keep our beaches accessible for all to enjoy. To help combat this problem, the Surfrider Foundation works with decision-making bodies to evaluate each beach access issue that arises. We also pursue litigation to ensure full and fair access to all beaches, for all people. In instances of existing public coastal access, we believe that the access must be retained or that new and increased opportunities should be provided—especially to those beaches or areas that offer recreational activities. Being able to access the places we love is something we take very seriously. We protect and preserve access to these places so that we can enjoy them. 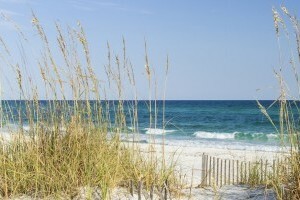 In nearly every state, some portion of the beach is public land, which means that all members of the public have the right to use that portion of the beach. 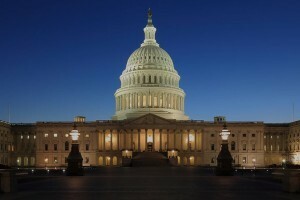 Surfrider Foundation recognizes that the public’s right of access to waterways is often based on the Public Trust Doctrine, and is further reflected in international, regional, and state laws and Constitutions. The right of beach access is constantly being challenged by private property owners, developers and even sea level rise. Of course, some wealthy landowners would like to lock up slices of the coast for themselves alone. 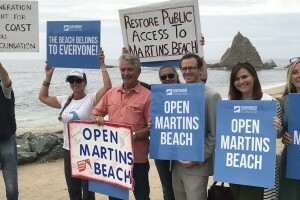 Surfrider Foundation is actively fighting for beach access in places where private property owners have cut off long-standing publicly used coastal access. 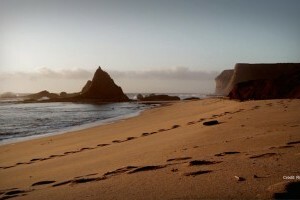 The Surfrider Foundation has developed a Policy on Beach Access, which addresses our stance on the many aspects of the issue of beach access. Open Martin's Beach in San Mateo County - Martin's beach is a beautiful crescent shaped beach, surrounded by cliffs on either side, in Half Moon Bay, California, that was recently cut off to public access in 2010 when owner and billionaire ventura capitalist, Vinod Khosla, locked the gate to the beach road, erected signage and hired security guards to exclude the public from the only access road. In 2012, Surfrider Foundation helped to successfully defend the Martin’s 5 who were ticketed for trespassing when they went to surf. In 2013, Surfrider Foundation sued the property owner for this violation of the California Coastal Act. And in 2014, we received a favorable ruling in that case, but Khosla has filed an appeal. Surfrider Foundation refuses to back down from this fight until the community beach is open again to the public. Maine Beach Access Litigation - Beach access legal battles in the state of Maine continue to persist due to conflicting case law in the previous decades. The Maine Chapter is committed to opening the public's right to use and recreate in the nearshore waters of Maine's coastal areas. The Chapter is currently litigating to establish a strong definition of the Public Trust Doctrine and ensure the coastal resources are protected for the public and future generations. 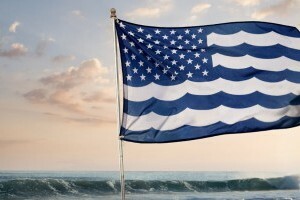 Texas Open Beaches - Surfrider Foundation Texas Chapters have been committed to upholding the intent and rights established by the 1959 Texas Open Beaches Act that proclaimed free and unrestricted public access to state owned beaches bordering the Gulf of Mexico. The Chapter is a current litigant on the side of the state in the Brannan v. State of Texas case and is also creating public outreach and awareness events to educate all Texans about their rights to enjoy the coast. Chicago Surf Access - Surfrider Foundation Chicago Chapter has been committed to opening up opportunities to surf in Lake Michigan. 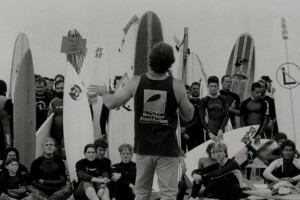 Despite past arrests of surfers, Surfrider and City representatives are working together to find more surf spots and permissible opportunities off the coast of the Windy City, while at the same time educating the public about beach access and water safety. Strands Beach, Dana Point, CA - Beach Access (2016) Fighting the unpermitted gates on the central accessway through the Headlands Development at Strands Beach in Dana Point has been a major battle for the organization since 2010. 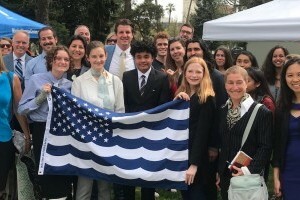 Surfrider Foundation won a major court victory in June 2011 when the San Diego Superior Court ruled the City of Dana Point acted “arbitrarily and capriciously” when passing the urgency nuisance ordinance to close the gates. The case was finally dismissed after a favorable settlement between the City of Dana Point and the California Coastal Commission. Eastport, Maine - Beach Access (2011) Surfrider Foundation won an important beach access case in the highest court in the state, when the Maine Supreme Judicial Court unanimously ruled in McGarvey v. Whittredge that private ownership rights in the intertidal lands do not allow oceanfront property owners to exclude the public from crossing the wet sand to reach the ocean in order to scuba dive or run a scuba diving business. Ponte Vedra, Florida - Beach Access (2006) The Surfrider Foundation won a lawsuit regarding blocked beach access points in Ponte Vedra, Florida. 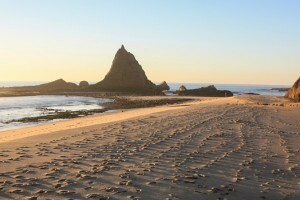 In this case, the number of perpendicular beach access sites was adequate, but the ability to use the sites was severely limited by a lack of nearby parking spots. Rockaway Beach, New York - Surfing Ban (2005) The Surfrider Foundation's New York City Chapter was successful in overturning a long standing surfing ban at New York's famed Rockaway Beach. Asbury Park, New Jersey - Surfing Ban (2003) The Surfrider Foundation local officials to repeal a ban on surfing at New Jersey's legendary Asbury Park Beach. Deal, New Jersey - Beach Access (1994) In the case, Surfrider Foundation v. Borough of Deal, the New Jersey Chapters were able to fight to ensure beach access for surfers in the state of New Jersey.